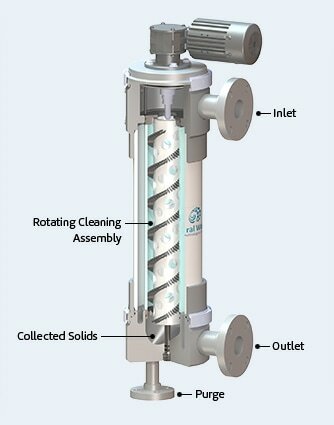 Spiral Water created the next generation filter by solving the specific technological challenges of ultra high and variable total suspended solids.No other automatic self-cleaning filter can perform at this level.Our patented Automatic Self-Cleaning Filter consists of a rugged stainless steel filter screen and spiral-shaped brush that continuously clean the screen without requiring back wash, crossflow, high differential pressure or downtime.The unique one-pass system automatically senses, concentrates and purges solids, providing seamless waste management and de-watering solutions as part of the process. Filtered water passes from the inside to the outside of the proprietary stainless steel filter screen. Spiral Water’s® patented, motor-driven, spiral-shaped brush continuously cleans collected debris from inside the filter element. Solids are driven to the bottom of the filter housing and stored in the chamber until they are expelled through an automatic purge valve. The system can operate at low inlet pressure and low differential pressure ( 1 psi). Influent concentrations of suspended solids can be variable and as high as 25,000 mg/l. No backflush, crossflow or booster pumps required.